Watch two things in these types of problems. First, the geometry of the situation — i.e. the orientation of the parabola and its various parts; and second, make sure your formulas are properly applied, as there are many k’s, p’s and a’s floating around and are a lot to contend with. 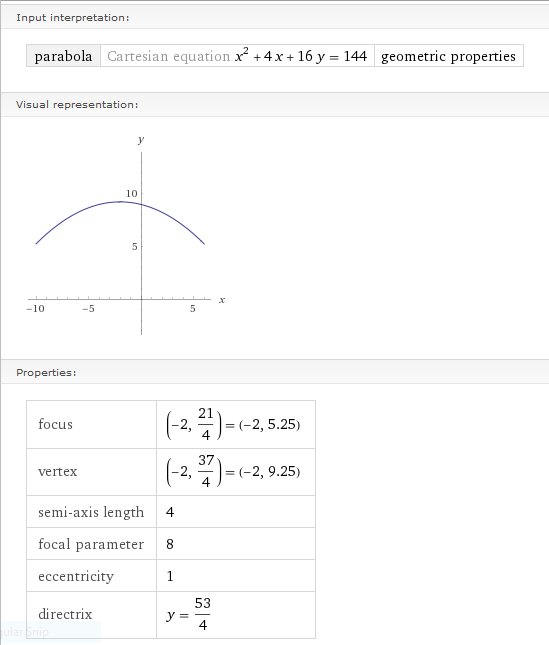 SEE ALSO: How to find the directrix of a parabola, given its vertex and focus. The geometry in this case is straight forward — we have a parabola that is opening upward in the plane. This is because we are quadratic in x (as opposed to y — see what to do here when it’s not), and the leading coefficient a is positive. See Figure A. Figure A: Determining orientation of parabola based on value of a. Because the parabola is opening upward, our focus will have the highest y-coordinate, the vertex will be south of the focus, and finally the directrix will be furthest south of them all. With that in mind, to actually find the vertex, focus, and directrix, you can either transform your y=x²-6x+15 into vertex form, or you can leave it, and use formulas for these from standard form. The consideration that I make when deciding which to use is whether the standard form is “easily” made into vertex form. When I look at y=x²-6x+15, I do not see a quick way to turn it into vertex form through factoring (meaning we would have to complete the square). Thus, I would keep y=x²-6x+15 in standard form and use formulas from there. To help us with our calculations, we’ve put together a quick reference “cheat sheet” in Figure B. Figure B: Parabola cheat sheet for vertically oriented parabolas: focus, vertex, axis of symmetry, and directrix. x = -b / (2a) = – (-6) / (2*1) = 6/2 = 3.
y = ax² + bx + c = 1*(3)² – 6 (3) + 15 = 9 – 18 + 15 = 6. Thus, the vertex is (3,6). TEST TAKING TIP #1: Notice here that we have only one answer that has vertex (3,6), and that answer is A. Thus, at this point, I would double check my calculations very carefully (as always, but especially in this case, as we would be betting the house on it), and pick that answer. Then move on to the next question from there. I’ll do this especially when the test is timed. We’ll continue the rest of the calculations, however, to be sure you know how to do the rest. The focus lies on the axis of symmetry of the parabola, and has the y-coordinate k+1/(4a). Because we just found the vertex to be (3,6), we know the axis of symmetry to be x=3, and the focus lies on that line. See Figure B. Its x-coordinate is therefore x=3. Because in our problem a = 1, the y-coordinate of the focus is 1/(4a) = 1/(4*1) = 1/4 north of the vertex. Thus, y = 6 + 1/4 = 6.25, and our focus is (3,6.25), which is what we were expecting from our selection of multiple choice answer A. TEST TAKING TIP #2: Note that we know that the vertex x-coordinate and focus x-coordinate are always the same. So even before we made any calculations in this problem, once we knew the parabola opened upward, we could rule out multiple choice answer D, as that option presents a vertex and focus with different x-coordinates. and the directrix is y = 6 – 1/4 = 5.75, once again confirming our answer of multiple choice option A. HOW DO I FIND THE CO-ORDINATES OF ITS FOCUS AND DIRECTION OF PARABOLA GIVEN THAT THE VERTEX IS AT (4,-8)? In this case, assuming you know that the parabola is vertically oriented, you’re going to need another piece of information in order to uniquely determine the parabola, determining its opening direction, or determine its focus. To see this: If we think for a moment and imagine the coordinate plane, and then imagine the point (4,-8) in quadrant IV, we can also visualize at least two parabolas that have this point as a vertex. The parabola with this vertex could open upward; or, the parabola with this vertex could open downward. Consequently, the parabola could have a focus that is above the point (4,-8) or below the point (4,-8). And, with only the single requirement that this parabola have the vertex (4,-8), there is no limit as to how wide or narrow the parabola will open when it either goes upward or downward. So we’re going to need some additional info, if the point (4,-8) is the vertex of the parabola. About the only thing we do know about this parabola is that if it’s horizontally oriented, the axis of symmetry is given by x=4. How do you find the equation of a parabola given only the focus, direction it opens, and a point on the parabola? Thanks for reaching out. Great question. These can be toughies. Basically what we want to do is start with the vertex form of the parabola equation, and use the information we are given to find the h, k, and a that are required to uniquely determine the equation. It’s easiest to see with an example, so I’ll come up with one and walk you through it. First, note that since we have the focus F(h,k+p) = F(2,3), this means we have h=2, and k+p=3. (See my parabola formula cheat sheet: http://www.protutorcompany.com/wp-content/uploads/2013/11/Prob20130529FigB1.png.) Note that the y-coordinate is k+p (as opposed to k-p) because the parabola is opening upward. 5 – k = a(3-2)² or 5 – k = a*1 or 5 – k = a.
k+p = 5 – a + 1/(4a). 5 – a + 1/(4a) = 3.
which has roots 1 ± sqrt(5)/2. a = 1 + sqrt(5)/2. k = 5 – [1 + sqrt(5)/2] = 4 – sqrt(5)/2. y – [4 – sqrt(5)/2] = [1+sqrt(5)/2](x – 2)². We can check to see that this is correct by plugging in our point (3,5) to see that it satisfies our equation of the parabola, and that the focus formulas F(h,k+p) actually produce the point F(2,3). Showing that (3,5) satisfies our equation of the parabola is pretty straight forward. Showing that the focus formula produces the point (2,3), particularly that k + p = 3, is more involved (i.e. messy). Here’s a photo of the calculations that show k+p = 3. I’m trying to solve this word problem. I’m not given an equation, I have to figure it out myself. But it doesn’t give me any information about a directrix or focus, so I don’t know how to find a. The only information I received from the problem is the maximum height is 8 yds and it lands 50 yds away. The equation I have right now is y-8=-1/4p(x-25)^2. Please help. Hi Vanessa — You’re already so close! You’ve got the vertex form of the equation up to a, like you said. Now use the fact that our projectile lands 50 feet away. That means that x = 50 and y = 0. Plug these values into the equation you have, and solve for a (or p), and you will have it! Hi Dawn — If you already have the vertex, the key to finding the focus and directrix is to find the value of p. Once you have p, then you just add and subtract it from the vertex to find the focus and directrix. In your example, we are given the equation of the parabola in the form, (y-2)² = 8(x+1). Since this is of the form y² = something, we know 8 = 4p, or p = 2. This is because the general version of this form of the horizontal parabola is y² = 4px (for the parent function), and (y-k)² = 4p(x-h) (in the translated case). Because p > 0, we know that the parabola opens to the right. So we add p = 2, to the x-coordinate of the vertex to get the focus. So the focus will have the x-coordinate -1 + 2 = 1. The focus coordinates, therefore, will be (1,2). The directrix will then be a vertical line, to the left of the vertex: p units to the left, to be exact. So in this case, the directrix will be the line x = -1 – 2, or x = -3. Thanks for your question. We’re actually presently working on additional materials to help readers with horizontal parabola problems. Your question has helped us to decide some of the topics to hit as we produce new content. How do you find the vertex given only the focus (-2,1) and the directrix x=-3 for a parabola? Hi Seth — Since our directrix is vertical, we know the parabola opens either to the left or right. Because the directrix is x=-3, and the focus is at (-2,1), we know the focus of the parabola is to the right of the directrix. Thus, the parabola opens to the right. Next, find the point on the directrix that has same y-coordinate as the focus. Notice the points on the directrix all have the form (-3,y). Thus the point on the directrix that has same y-coordinate as the focus is (-3,1). Hi Tracy — One way is to start by finding the vertex form of the parabola, and then convert it to standard form. First, note that the directrix is y=”something”, and is a horizontal line, meaning that the parabola opens either upward or downward. Because the vertex is (0,0) and above the directrix y=-1/16, we know the parabola opens upward. This means the last piece of information we need to find is a. For a vertically oriented parabola, the directrix equation is y=-p, where p = 1/(4a). In our case, y=-1/16, so p=1/(4a)=1/16. When we solve this for a, we get a=4. It comes from the definition of p. p=1/(4a) is for every parabola. It gets its own letter because geometrically its absolute value gives the distance between the vertex and the focus, and the vertex and the directrix. Then the general directrix equation for a vertically oriented parabola is y=k-p, where p=1/(4a). I edited the previous comment to clarify this. Basically the problem gives us the y=-1/16, which gives us p=1/16. Then the definition of p gives us the link between p and a that we need to get a, the last info we need to get our equation. If the text you are using hasn’t used p before, then you can always write the general equation of the directrix as just y=k-1/(4a). Remember k is the y-coordinate of the vertex (h,k), and is k=0 in our problem. See Figure B, in the main article, for a cheat sheet of parabola formulas to see an illustration of this. What about this standard form? I can’t figure out how to find my directrix or focus. I found the vertex though. the same relationship, p = 1/(4a) applies. h=5 and k=-2, so you are indeed correct that the vertex is (5,-2). so we see that p = 1/4. If p = 1/(4a), and p = 1/4, then p = 1/(4a) = 1/4, and a = 1. We don’t have to, but I like to visualize what these parabolas look like in the plane, so we can rely more on our geometric intuition and worry less about picking a correct formula. We know the form of the equation is quadratic in Y, not X, because the equation is of the form X = aY². So the parabola is on its side; it opens either to the left or to the right. Because a=1, a>0, so we know the parabola opens to the right. Because it opens to the right, the focus will be p units to the right of the vertex, and the directrix will be a vertical line p units to the left of the parabola. OK, so with that in mind, lets do some calculations. First the focus, which we said we know will be p units to the right of the vertex. Since we found the vertex at (5,-2), the focus has to have x-coordinate x = 5+p = 5+1/4 = 21/4. So we have the focus at (21/4,-2). Now, to find the directrix, I always first calculate the point on the directrix the shortest distance from the parabola. In our example, we said this is p units to the left of the vertex, or 5-p = 5 – 1/4 = 19/4. So, the point on the directrix the shortest distance from the parabola is (19/4,-2). That point, itself, isn’t so important, but because the directrix is a vertical line passing through this point, we know the directrix equation has to be x = 19/4. Find an equation in standard form of the parabola described. how do i get this standard form please? Hi Brian — We start by visualizing the vertex at (-5, 8). We are given a directrix, and note that because it is y=something, the directrix is horizontal. Because the directrix is horizontal, we know the parabola opens either upward or downward. Since we are given that the vertex y-coordinate is 8, the directrix at y=3 is below the vertex. Parabolas always open the opposite direction of the directrix. Thus, we know the parabola opens upward. Note that we are missing only the value “a” — which we will obtain from the given directrix at y=3. Solving for a, gives us a = 1/20. How to find the equation of parabola whose vertex is (-2,-1) and focus is (-1,-1) ? x = a(y-k)^2 + h.
x = a(y+1)^2 – 2. -2 + 1/(4a) = -1. When we do, we find a = 1/4. Thus, our equation is x = (1/4)(y+1)^2 – 2.
x = (1/4)y^2 +(1/2)y – (7/4). how do i locate the vertex,focus,endpoints of the LR and the equation of the directrix of a parabola whose equation is: a. )x^2+2x+4y+1=0 b.)x^2+8x-2y+20=0. y = (-1/4)(x + 1)². Generally, the vertex for y – k = a(x – h)² is (h,k), so our vertex here for y – 0 = (-1/4)(x-(-1))² is (h,k)=(-1,0). For the focus and directrix, I first try to get a feel for where everything is in the plane. You don’t have to do this, but I think it helps to make it more intuitive, and the various components are more meaningful, once we calculate them. Note that because our function is quadratic in x, meaning the variable that is squared is x (and not y), the parabola is vertically oriented, which means the parabola opens either upward or downward. Generally, the parabola y – k = a(x – h)² opens upward when a > 0 and downward when a < 0. In the case of y = (-1/4)(x + 1)², a = -1/4 < 0, so the parabola opens downward. For a vertically oriented parabola, the directrix equation is y = k – 1/(4a). So when k = 0, and a = -1/4, the directrix equation is y = 0 – (-1) = 1. The focus is at the point (h,k+1/(4a)). The y-coordinate: k + 1/(4a) = 0 + -1 = -1, such that the focus is (-1,-1). LR endpoints are the points on the parabola that have the same y-value of the focus. To find this, you can either plug the y-value of the focus into your parabola equation and solve for x, or you can use the formula x = h ± 1/(2a). With h = -1, and a = -1/4, this gives us x = -1 ± -2 = -3 or 1.
y = (1/2)(x² + 8x + 20). the “a” and “b” terms to one side, and everything else on the other side. (2y – 20) + 16 = (x² + 8x) + 16.
y = (1/2)(x + 4)² + 2. (-4, 5/2), directrix at y = 3/2, and LR endpoints: (-5,2) and (-3,2). Hi Katie — I always think about this in three steps: (1) whether the parabola opens upward/downward or sideways; this allows me to know (2) whether the axis of symmetry (“AOS”) is vertical or horizontal; which then (3) tells me whether the directrix is horizontal or vertical. For example, because y=4x^2 opens upward, we know the AOS is vertical, and the directrix is horizontal, always being perpendicular to the AOS. So the directrix equation is “y=” instead of “x=”. Eventually after you do enough of these you will begin to have an intuition about where the directrix is relative to the parabola. (Always sitting on the other side of the vertex from the focus, perp to AOS). Until then, just think through these three steps. I’m stuck on this problem… How do you find the focus and directrix if you only have the vertex (0,630) and x-intercepts (315,0) (-315,0)? Hi Christina — Whenever I am given the x-intercepts of a parabola, I immediately think of the related problem of being given the roots of a quadratic equation and being asked to find the equation of the quadratic. The thought being, if we can actually find the quadratic equation that has these intercepts, we can answer any questions about its graph, such as the parabola’s focus and directrix, as we are asked about in this problem. So that’s my first thought as I start thinking through how to approach this problem. So in general, if the x-intercepts of a parabola are given to be (s,0) and (t,0), then the equation of the parabola is y=a(x-s)(x-t). Then, if I know the values of s and t, we only have to find the value of a to have the complete equation of the parabola. Once we have that, we can find the focus and directrix. So, in your example, we have intercepts (315,0) and (-315,0), so our equation of our parabola is y=a(x-315)(x+315). 630 = a(0 – 315)(0 + 315). When we solve for a, we find a = -2/315. y = (-2/315)x² + 630. Because a < 0, we know the parabola is opening downward, and the focus is 1/|4a| units below the vertex. From our formulas above, for a vertically oriented parabola with vertex at point V(h,k), the focus is at the point F(h,k+1/(4a)). In our example, our vertex is at V(0,630), so the focus is at the point F(0,630+1/(4*-2/315)) = (0,630-39.375) = (0,590.625). The directrix, which is 1/|4a| units above a downward opening parabola, has the equation y = k – 1/(4a), again where the vertex is V(h,k). So in our case, the equation of the directrix will be y = 630 – 1/(4*-2/315) = 630 + 39.315 = 669.315. Hi Kira — A parabola’s focus can’t lie on its directrix. The point (2,0) is a point on the line x = 2.
and so the vertex is (-2, 37/4). Because a = -1/16 < 0, the parabola is opening downward from its vertex. Because the parabola is opening downward, we know the focus then is 1/|4a| = 4 units below the vertex, or at (-2, 21/4). The directrix is then the horizontal line 1/|4a| = 4 units above the vertex, or y = 53/4. We can also check our answer at the Wolfram Alpha website. It is possible to sketch the graph of parabola given the coordinates of the focus and the vertex?why or why not? Explain how to determine whether the graph of a parabola opens upward, downward,to the left or to the right.